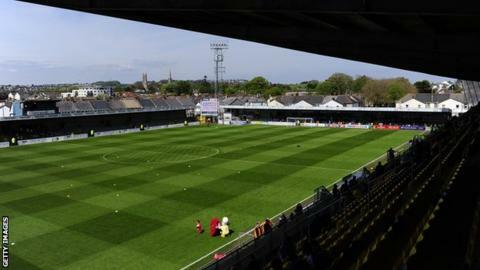 Torquay United's Alex Fisher hopes Tuesday's 2-0 FA Trophy first-round replay victory at Chesham will kick-start their season. Two goals from Andre Wright gave the Gulls, who sit 22nd in the National League, just their second victory in 22 games in all competitions. "We knew if we did the right things then the result would follow," Fisher told BBC Radio Devon. "There's nothing better than getting the win under the belt." The victory ended a run of nine games without a win, but Fisher insists the team remain in good spirits. "We've got a great set of lads here," he added. "It's not the best situation we're in but if you see the morale around the camp there's not much worry. We know things can be put right quickly." The 25-year-old former Mansfield Town forward was a doubt for the game with a slight knock, but played through the pain. "We are short on numbers and I picked up a niggle last week, but when you're told you're going to start you roll up your sleeves," Fisher added. "We've got a couple of goals, a clean sheet, and hopefully we can take that kind of performance through to the weekend."